Advanced Summer Camps are available to new or returning athletes that wish to join one of our youth teams. We have two offerings. A Tune Up Camp or a Performance Camp. 1- Tune Up Team Camp: If you want to tryout for a youth team, develop new skills, and learn how to improve your climbing, then this camp is for you! Tune up summer camp prepares youth climbers to tackle their climbing endeavors. Do you want to challenge yourself and reach new heights? Do you want to climb harder grades? Do you want to earn a spot on a team? Whatever your goals may be, Tune up camp can help get you started! Spend time working with coaches to explore and perfect movement in skill set workshops. Practice mental exercises that promote body awareness, fear management and self confidence. Dive into a real competition experience with valuable feedback and guidance from coaches. 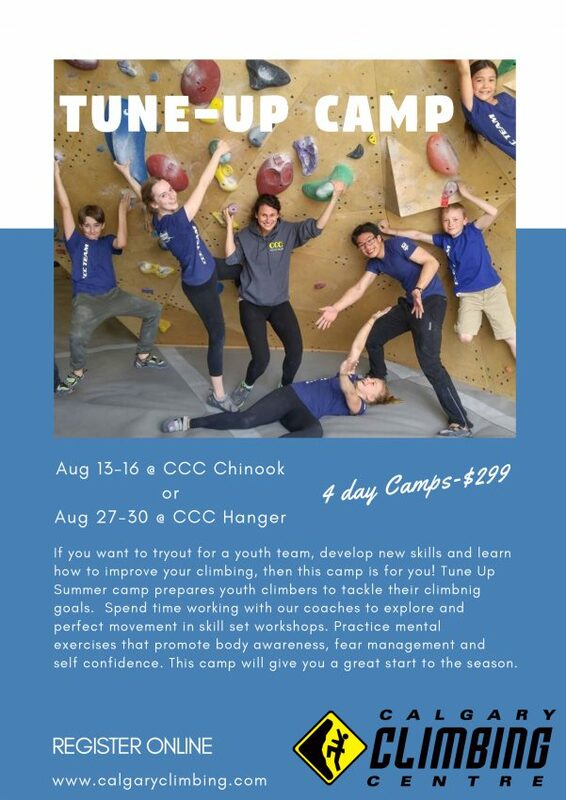 Tune up summer camp is packed with information that goes beyond the climbing gym, fostering an atmosphere of health, confidence, determination and climbing for life! Schedule & Location: 4 days from 9am to 4pm. Prerequisites: This camp is for new or returning climbers that want to prepare for our Junior Team Tryouts. This Camp will help the athletes be better prepared and in shape for the start of climbing this fall. Participants should know how to belay if they are 14 and up. No belay experience needed if younger. This camp is for ages 10 and up. 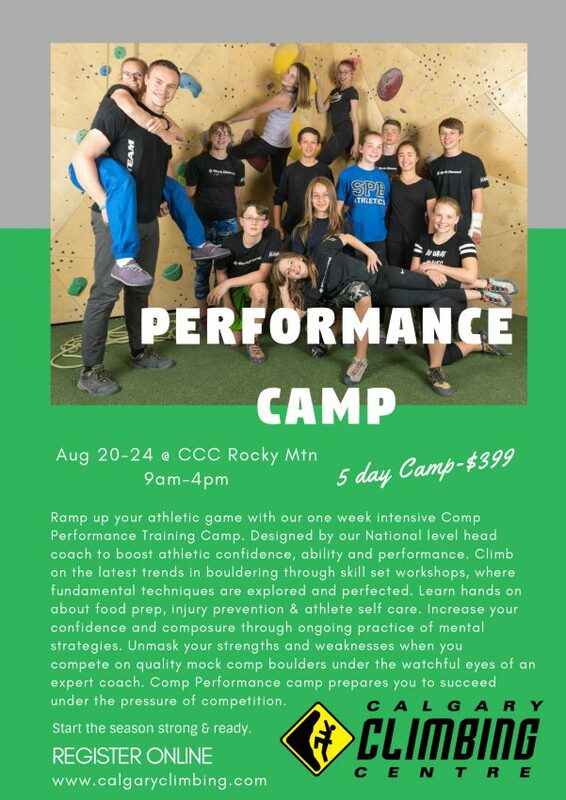 2-Comp Performance Team Camp: Ramp up your athletic game with our one week intensive Comp Performance Training Camp, designed by our National level Head Coach to boost athletic confidence, ability and performance. Freshen up on the latest trends in bouldering through skill set workshops, where fundamental techniques are explored and perfected. Learn hands on about food preparation, injury prevention & athlete self care. Increase your confidence and composure through ongoing practice of mental strategies. Unmask your strengths and weaknesses when you compete on quality mock comp boulders under the watchful eyes of an expert coach. Comp Performance camp prepares you to succeed under the pressure of competition. Dive into this season strong & ready. Schedule & Location: 5 days from 9am to 4pm. CCC Rocky Mountain on Monday Aug 20th to Friday Aug 24th. Prerequisites: This camp is for experienced climbers (previously on a CCC team, or equivalent) that want to improve their competition mindset and results. This Performance camp will help the athletes be better prepared and in shape for the start of climbing this fall. Participants should know how to belay. This camp is for ages 11 and up. We are also offering a Summer Team Training Group for our existing Team Athletes. Click HERE for Summer Team info and registration. and for something different we’ve also got a Speed Club Starting.